There are many online reviews of earphones that provide non-scientific opinions with comments such as “excellent bass response”, “clear mid-ranges”, and so on, without providing any measured results. As an engineer and a researcher, I find these unsubstantiated claims unsettling. 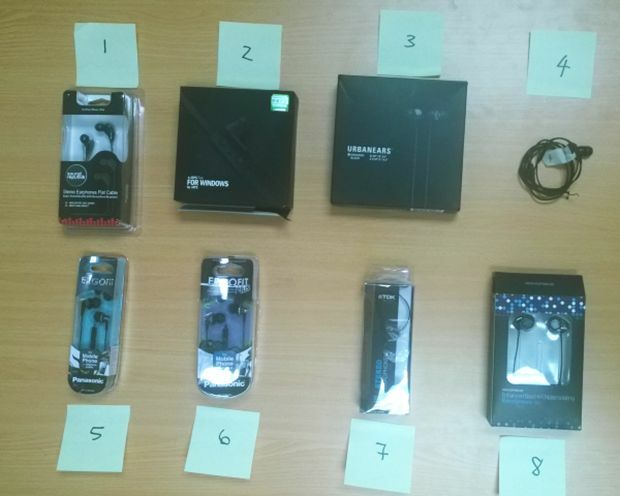 We did a literature review on the internet to find articles that recommended low-price earphones and conducted instrumented testing. 1. Sound Republik. Bought from an Australian supermarket chain called Coles. The packet made the claim “super sound quality with heavy bass response”. 2. aJays five. These were the most expensive earphones tested at $A100. They did not fit my ears very well and there was a lot of noise generated in my ears from the cable rubbing on my clothes. 3. Urbanears Kransen Black. These ended up being my favourite and I now use them daily. 4. 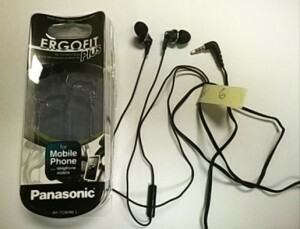 LG E900 mobile phone earphones. I liked these and they sounded reasonable. 5. Panasonic RP-TCM125. 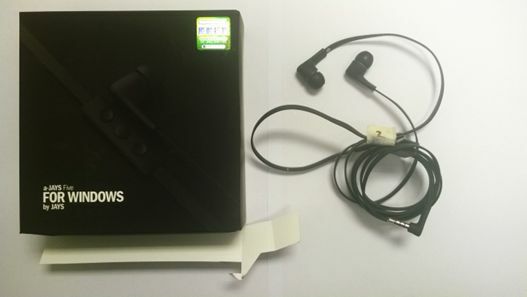 These headphones have received many favourable online reviews for being reasonable quality at a low-price. However, I was unable to find any measured results to substantiate the claims. 6. Panasonic RP-TCM190. These are very similar to the RP-TCM125, only they are meant to have an ergonomic fit for a “Powerful Bass”, according to the packet. 7. 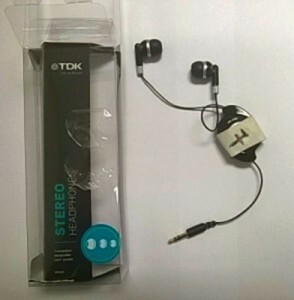 TDK EB350. 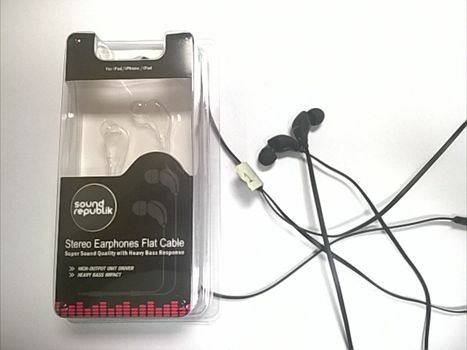 These are cheap set of earphones (about $A20) from an Australian retail shop. 8. 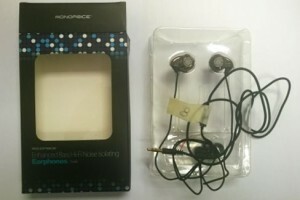 Monoprice EAR-8320. These earphones were also rated highly in online reviews. According to the front of the packet they are “Enhanced Bass Hifi Noise Isolating”, but as we will see in the results, they had the flattest response of all earphones tested, and the lowest bass response. The instrumentation that was used to test the earphones is shown in the following image. 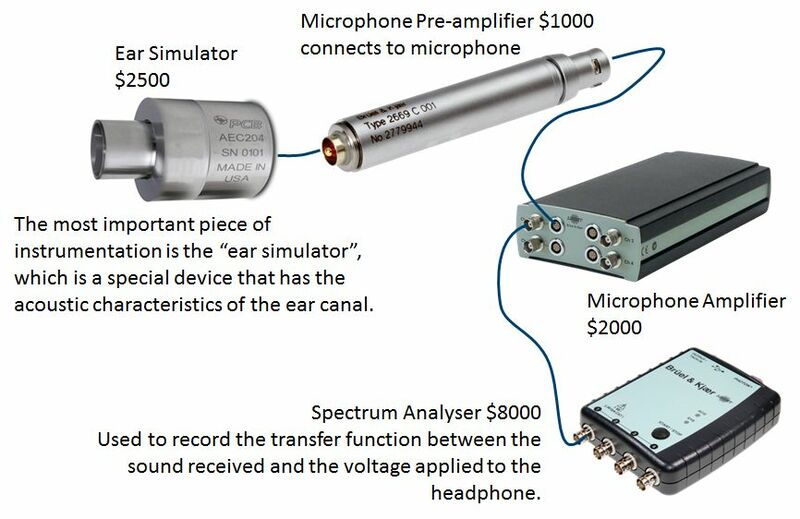 The key piece of the instrumentation was a PCB AEC204 occluded ear simulator that costs $A2500 and has a standardised acoustic impedance of a human ear. In plain terms, the acoustic response of the instrument is very similar to a human ear. 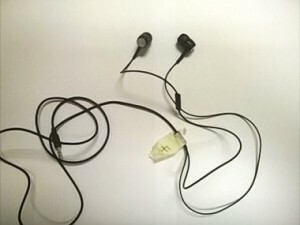 The earphone to be tested is inserted into the open end, and a calibrated microphone that is built into the device measures the sound. A Bruel and Kjaer type 2669 microphone pre-amplifier ($A1000) and a Bruel and Kjaer type 2829 microphone power supply ($A2000) is used to generate a voltage from the minuscule movement of the microphone diaphragm. The resulting voltage is measured on a Bruel and Kjaer Photon spectrum analyser ($A8000). 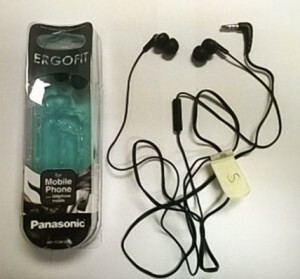 The Photon spectrum analyser was used to generate a “pink noise” electrical signal that was fed directly into the earphone that was being tested at the time. The “pink noise” electrical signal was also fed into channel 1 of the spectrum analyser. The sound from the microphone was fed into channel 2 of the spectrum analyser. There are a few specialist software packages available for analysing earphone and headphone responses. However, we were interested in some basic characteristics and a standard transfer function measurement sufficed. The transfer function is the ratio of the electrical signal from the microphone that measures the sound output from the earphone divided by the electrical signal that was sent to the earphone. 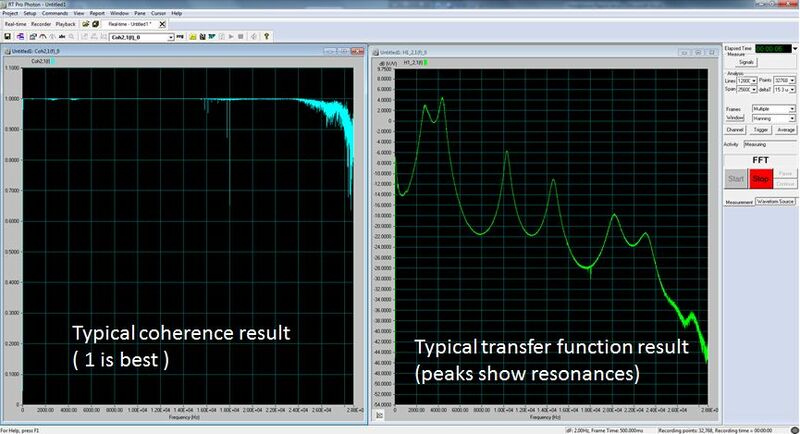 The following image shows a typical coherence and transfer function measurement from one of the earphones that was tested. The coherence indicates how well the measured signal is correlated with the input signal, and a value of 1.0 means that it is well correlated. This measurement is only used to ensure that the test is good and nothing weird has happened. The result of interest was the transfer function measurement, shown in the figure on the right with the green curve. The curve has a number of “peaks” and these indicate where there is a resonance response at a particular frequency. Here are the transfer function measurements from all 8 earphones plotted in decibels and logarithmic frequency in Hertz. The human ear responds logarithmically to pressure and is often expressed in units of decibels. I appreciate that this graph looks like a bunch of squiggly lines to most people, so I’ll add some comments. The first thing to notice is that none of the earphones have a totally flat response. 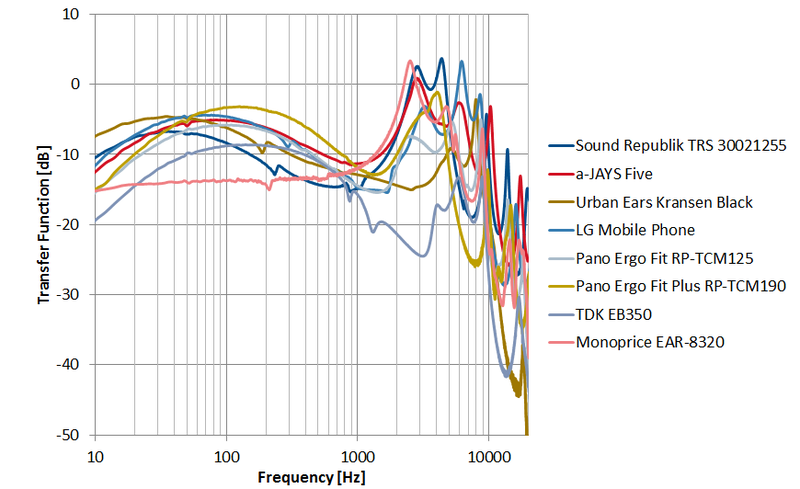 For many acoustic devices, one wants a totally flat response so that there is no biasing of sound or measurements. For example, all the instrumentation that was used to measure the sound from the earphones such as the microphone, microphone amplifiers and spectrum analyser, have a flat response. Most of the earphones have a small peak around 100Hz in the bass frequency range (except for the Monoprice EAR-8320), and all have multiple resonances above 1000Hz. All these results can be misinterpreted so you have to be wary when comparing between earphones. For example, although earphone A might have a higher output at a particular frequency compared to earphone B, this is not particularly important when listening to it as one can simply turn up the volume. What is perhaps more important is the relative distribution, or the shape of the frequency response curve, for the music that you listen to, and your expectation of how it should sound, and this is a personal choice. For example, I like listening to house music with plenty of drum and bass. For me, I was after a set of earphones that has a good bass response between 50Hz to 100Hz. If you are into classical music that has lots of detail in the mid- to high- frequencies, your preference for earphones is going to be very different from mine. First have a look at the brown curve for the Panasonic RP-TCM190, the ones that claimed to have an ergonomic fit for better bass response. At 100Hz in the bass frequency range, it had the highest bass output. This has to be put into context because the graph is in units of decibels and usually humans are not able to distinguish differences of less than 3 dB. 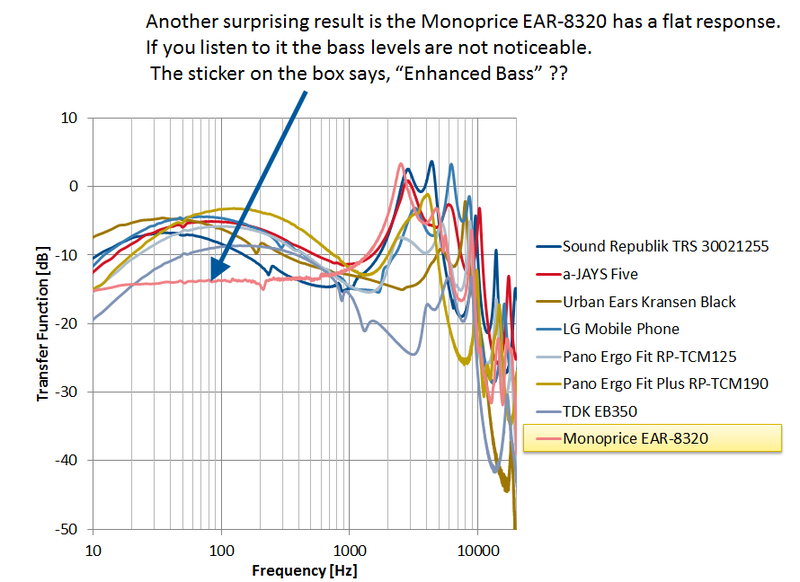 Another surprising result was that the Monoprice EAR-8320 (the pink curve) has a very flat response from 10 Hz to 600 Hz, in the bass frequency range. We re-tested this many times to make sure that we had not done anything wrong. If you listen to these earphones in your ear, the bass response is not really noticeable. This often a good feature because it does not bias the sound. However written on the front of the box is “Enhanced Bass”, but this claim did not stack up against the other earphones that were tested. If you are listening to music that has heavy bass and you enjoy the heavy bass, then it is unlikely that you’ll find the bass response from these earphones satisfactory. Again, don’t be misled that it had one of the lowest bass outputs at -15dB be concerning, because one can just turn up the volume to get more bass. However, the trouble with doing that is you can see at there are some peaks at around 2500Hz, and if you were to turn up the volume, these mid-range frequencies also become much more noticeable. 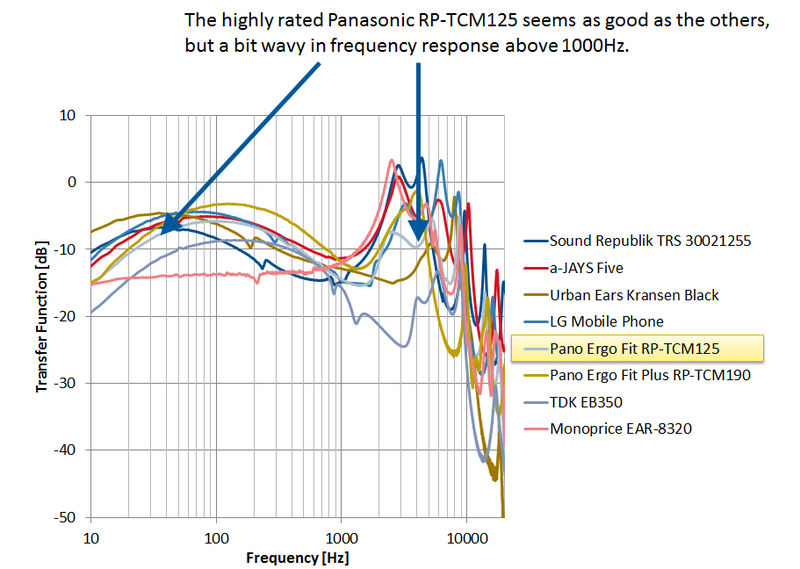 The Panosonic RP-TCM125 earphones, that have received many favourable online reviews, shown by the light blue curve, has a transfer function in the middle of the pack. These earphones are fine, and there is nothing remarkable about them, which I think is the reason why they get favourable reviews, because they are not sound biased and are relatively inexpensive. However, for my taste in house music, they are average and I was after something with a bit more bass. 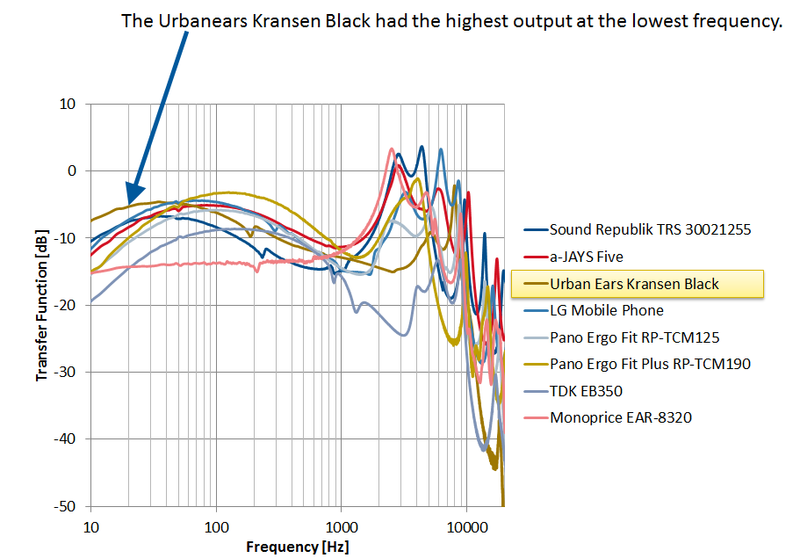 The Urbanears Kransen Black had the highest output at the lowest frequency. These ended up being my favourite earphones for listening to house music and I use them daily. I was using and liked these earphones before seeing these test results and confirm my preference for an earphone with good output at 50Hz to 100Hz. 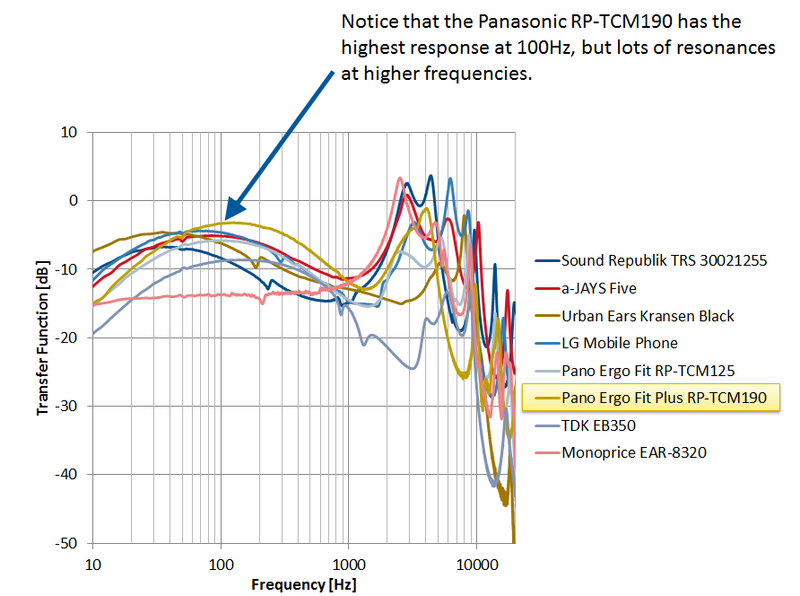 These results also highlight that I should also try out the Panasonic RP-TCM190 Ergo Fit Plus earphones as well. 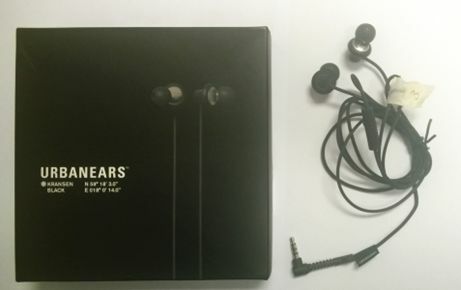 I also liked the earphones that came with my LG E900 mobile phone, and now I can see why, because it has a low frequency response very similar to the Urbanear Kransen Black. Acknowledgements: Thanks to Jordan Belperio for doing the measurements of the earphones.